Mmmmm…my house is filling up with the aroma of banana, oats and honey as I type this. These chewy banana bars are delicious and guilt free. I made some changes to this batch and I’m really hoping they turn out well. I’m trying to add more protein into our son’s diet so I added powdered rice protein to this batch. I did some additional tweaking to compensate for the blah taste of the powder. I also decided to use a spring scooper and drop these by the tablespoon onto a cookie sheet. I’ve always spread the mixture into a bar pan in the past. I think this will be much easier. 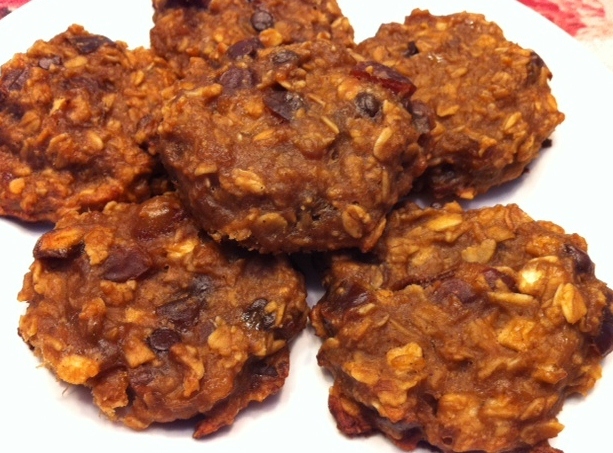 These are not super sweet cookies…think more along the lines of breakfast cookie! Next time I make these I think I’d like to add some molasses or possibly a pumpkin sugar icing. This recipe is so simple. There is no dairy, no soy, no egg, no nuts, no gluten, no corn (I’m trying to think of additional common allergens…none come to mind). It can easily be doctored up around allergens and preferences. Just play around with it. I like to make a big batch and toss them in the freezer. They work great for packed lunches and snack because they thaw by the time they’re eaten. Drop by tablespoon onto cookie sheet and flatten the tops a little. Bake the banana bars for 15-20 minutes. I highly recommend making a powdered sugar icing to give the cookie/bars just a little sweetness. Looking for more cookie recipes? Take a look at http://artofdessert.blogspot.com/2011/11/call-for-submissions-cookie-exchange.html for more allergy friendly desserts.